What group of people would benefit the most from this book and why? 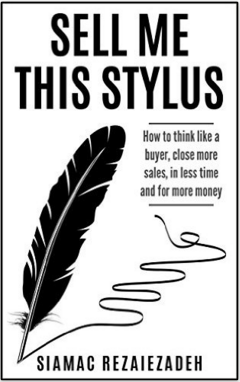 If you are selling a product or service and you are looking to improve your sales numbers, gain more control of your sales process or simply enjoy yourself throughout the sales cycle, then you should read this book. The framework I outline is one I put together over a number of years that enabled me to do all of the above and more. Can you describe the book in one or two sentences for our readers? The book takes the reader through a tried and tested “selling framework” of seven phases, from choosing potential customers to actually winning the deal. Each phase comes with practical tips on what you actually need to do to succeed and why. What influenced you to write it and how long did it take you? As I say in the book, when I started my career in technology sales I was given a lot of training on ‘what’ to sell and a lot of training on ‘why’ we sell it, but not really a great deal of training on ‘how’ to actually go out and sell. I started researching different sales methodologies, implementing and testing them over the course of my career, which ultimately led to this book. So I guess you could say it has been in development for the best part of ten years, although the bulk of the writing took place over the last six months or so. Do you have any more books planned? I’ve been thinking a lot about ‘future’ technologies and their impacts on society and business recently. Developments such as artificial intelligence have the potential to dramatically change the world as we know it in both positive and negative ways. I’d love to write about that. Do you have a favorite book that inspires you? I like a lot of non-fiction but the book that really stood out for me and taught me to look at life and its possibilities a little differently was The Four Hour Work Week by Tim Ferriss. In terms of fiction I’m going to cheat a little and give you a series of books: The Accursed Kings by French author Maurice Druon (original title Les Rois Maudits). You can find me on Twitter as @siamac or via my website, www.siamac.london. Please do get in touch if you have any questions about the book, I’d be happy to help. If you want to talk about future tech I’d also be very pleased to chat! Nobody really taught me how to sell. That’s the uncomfortable truth. I was hired as a recent university graduate to join a sales team and then as I progressed in my career people around me continued to expect me to sell. In fact they always expected me to sell more, sell bigger and sell better. All of which was perfectly rational as it was what I was being paid to do. But the problem was I did not really know how to do it. In almost every other business area you are expected to bring substantial training and qualifications that enable you to do your job. The legal department is staffed with certified lawyers, qualified accountants run the finance team and the members of the product marketing team usually studied marketing or have relevant MBAs. Engineering teams are rigourously selected based on their degrees and demonstrable engineering skills. What this means is that when you join these teams, you can fully expect to apply your knowledge and theory to real world situations. However for some reason ‘sales’ is viewed as different. Based on precisely what the hiring manager is looking for, one would ordinarily select the best option within the group of candidates you have. When I was in that first cohort of young, hungry would-be trainees I was fresh out of university and excited to get started. Like most people, I didn’t go to university to become a salesperson. It seems to be the case that in most organisations the sales team will have people from all walks of life and educational backgrounds. My goal was to join a technology company that operated in the cloud and mobile spaces as I had marked these as future trends. So I joined a growing technology company in London and was eager to make my mark. I wanted to learn about the company, its products and most importantly ‘how to sell’. What followed over the next few months was a detailed indoctrination to the company, the company’s strengths and weaknesses alongside the culture of the business. I jumped in at the deep end and immersed myself with details of the company’s products and the industry in which they operated. There was a lot to learn and colleagues from various teams were eager to help. But I started to run into problems when it came to the ‘how to sell’ bit. Nobody had ever taught me how to actually do it. I was hired so I assume I managed to display some qualities and characteristics that are useful in sales, but I had no idea what process to follow, what to say, what not to say and when to take action. So I started asking around. ‘What makes a great sales person?’ I asked an experienced colleague. ‘Well,’ started the reply, ‘for a lot of people, it is just something they are born with – they know how to talk to people’. Another related response: ‘You see Rob over there, well he is a great salesman. Everyone likes him and they like buying from him. If you can get people to like you, they will buy from you’. Did that mean I had to be friends with everyone I sold to? I was not overly convinced. There may be elements of truth to what I was hearing but I didn’t buy it as a blueprint for selling. So I decided to embark on a long journey of discovery.